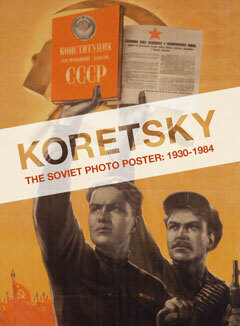 Viktor Koretsky (1909–1998) was a leading Soviet artist and the acknowledged master of the Soviet photographic poster. With a long and prolific career that spanned the early Stalin era through to the onset of Glasnost, Koretsky produced some of the most memorable images of World War II and the Cold War from the point of view of the USSR. The first comprehensive catalogue of Koretsky’s work in any language,this stunning and richly illustrated album provides an essential introduction to the major examples of Koretsky’s artistic output, including posters, original designs, and other political graphics. An introductory essay by noted art historian Erika Wolf provides a fascinating general overview of the Soviet political poster, situating Koretsky’s work historically, politically, and artistically. The core of the volume is a series of two hundred full-color plates, each accompanied by a concise commentary that clarifies its significance; arranged chronologically, these works of political propaganda art brilliantly record the shifting political and artistic circumstances of the distinctive eras of their production—the first Five-Year Plan, World War II, postwar Stalinism, the Thaw, the Brezhnev era, and the twilight of Soviet authoritarian culture. Richly annotated with related primary source quotations, a chronology, and a glossary of Soviet culture, Koretsky is a groundbreaking contribution to our understanding of this influential and little-understood artist.